A pond is a small to medium body of standing freshwater of less than 2 hectares in size and without any significant current. Ponds can be natural or artificial and can include small reservoirs, flooded quarries and gravel pits. Ponds can hold water permanently or seasonally and some may dry up during prolonged periods of dry weather. Most ponds in lowland agricultural areas of Ireland tend to be nutrient rich (eutrophic) due to enrichment from high levels of nutrients from artificial fertilisers and slurry etc. entering the water directly or indirectly. Improvements in drainage techniques have resulted in the disappearance of many wetland habitats on intensive farmland and ponds have become very infrequent on farms throughout the country. Pond creation is a unique feature of the BRIDE Project and this measure is integral to the landscape-scale approach of the project. Ponds can be created by excavating a wet or damp site and compacting the basin (if necessary). Alternatively, water springs or small streams can be dammed and an overflow sluice installed to regulate water levels. The pond does not need to be more than 1 metre in depth and it is important to have shallow, saucer-like margins. It is very important that no existing habitat is damaged when creating a pond. Only use native pondweeds when stocking the pond. 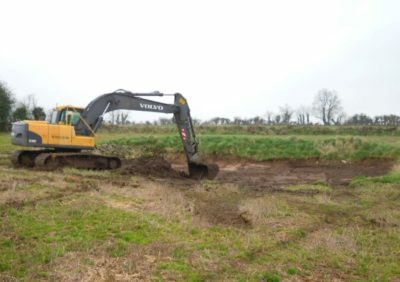 The BRIDE Project recommends that the area of the pond is at least 10 metres x 10 metres surrounded by a margin of at least 2 metres in width and fenced off from surrounding agricultural land. • Livestock should not have access to the pond. • No spraying of herbicides or applications of slurry should take place within at least 3 metres of the margin. • Shading should be kept to a minimum around the pond and ideally no more than 10% of the pond should be shaded by trees. • Vegetation around the pond should be controlled and any encroaching vegetation should be cut back. • Logs and stone piles around the margins of the pond provide good shelter for adult frogs and newts. 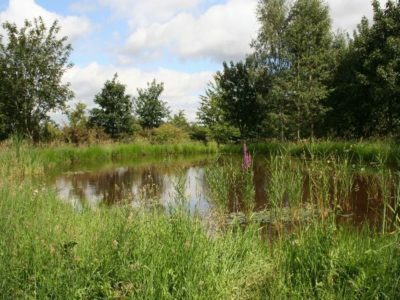 • Ideally, the pond should be situated close to woodland or a hedgerow to facilitate the development of wildlife corridors. • We do not recommend introducing any fish species apart from native sticklebacks (as larger fish prey on amphibian tadpoles and insect larvae). Ponds are wonderful habitats for a wide range of wildlife and they can contribute greatly to enhancing the biodiversity of any farm. Native pondweeds thrive in well maintained ponds and wide range of insects such as damselflies, dragonflies, pond skaters and whirligig beetles spend their entire life cycle in and around ponds. Ponds are very suitable habitats for frogs and newts. Ponds are important habitats for several bird species such as Mallard, Moorhen, Snipe, Willow Warbler, Sedge Warbler and Reed Bunting. Most of Ireland’s bat species regularly hunt insects around ponds.